How do professional sales training companies sell sales training? The best ones use the same sales processes they offer to own prospects and clients. If their sales processes didn’t work, they couldn’t stay ahead of their competitors. Like every other business, in the crowded sales training market space, nothing happens without a sale. 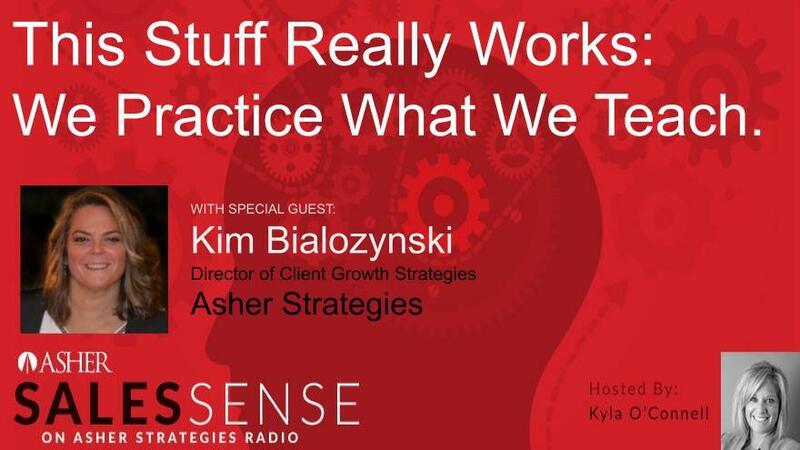 The April 18th Asher Sales Sense podcast will feature super salesperson Kim Bialozynski, Asher Director of Client Growth Strategies in “This Stuff Really Works: We Practice What We Teach.” Host Kyla O’Connell will lead the discussion of how Kim combines expert product knowledge, skillful client conversations, and dogged determinism to develop and grow business relationships and bring in new clients fast. Tune in and find out what elite salespeople do to win over customers and increase the top line. And have fun doing it. At Asher, I'm responsible for developing and growing relationships with B2B professionals. I focus on partnerships within our current account base by introducing Asher's transformative team development products and services to CEOs, HR directors, and sales managers. I also introduce our methodologies to new clients and assist them with creating customized plans to develop their teams and, ultimately, increase their revenue. Job titles aside, every member of a professional team must be able to help others understand what they do and what they have to offer. Each conversation is an opportunity to communicate your or your company's value, so even though you may not hold the position of a salesperson, it's critical that selling be a part of your resume. Everybody is in sales! As the Director of Client Growth Strategies at Asher, this is what I focus on every day — providing our current account base and new clients with the opportunity to hone their sales skills through our varied services. From here, we work as a team to come up with customized strategies and, ultimately, increase revenue for their business. For me, the real success comes with connection to our customers. The most unique service Asher offers is the Advance Personality Questionnaire (APQ) sales assessment. While many clients use this tool solely for hiring, my job is to make sure our clients use it for coaching and development as well, employing it consistently throughout the career of an employee and a sales team. My specialties include Sales Aptitude Assessment Training, Personality Assessment Interpretation, B2B Sales, CRM, Marketing Strategy, Training and Development Services, Business Development, and Account Management. Asher Sales Sense Radio is hosted by Kyla O'Connor and John Asher. The program is sponsored by Asher Sales Strategies on the Funnel Radio Channel.